This weekend I started seeds — tomatoes and leeks right now. 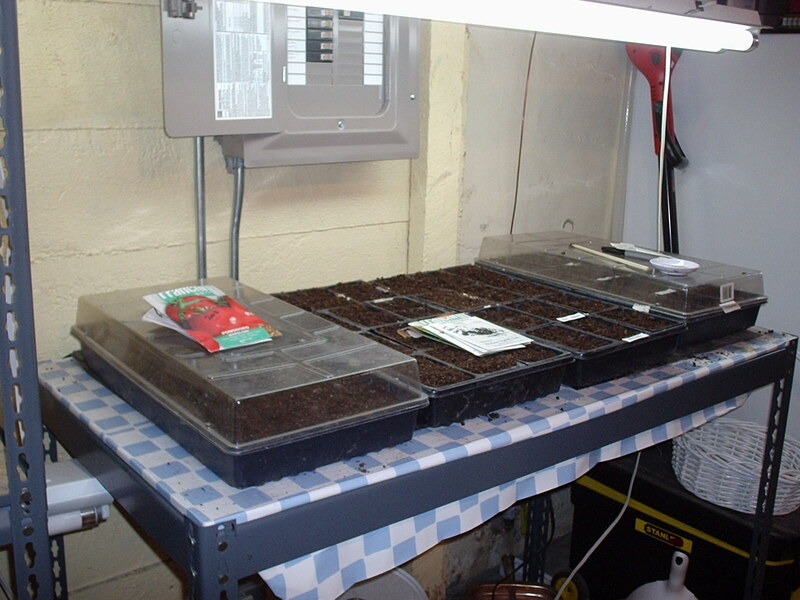 I’ve blogged before about my seed starting setup, and nothing’s changed since last spring, so I’ll simply send you to this older post if you want to know the mechanics of how I get things rolling every year. This is a new variety for me. I picked up the seed packet at the local food co-op last summer. Marmande from Seeds of Italy I love this tomato. It’s a slightly flat, delicious French heirloom. Grushovka Siberian from High Altitude Gardens I’ve had good luck with the Siberian tomatoes in the past — they come in at 3-4 ounces, nice red, round fruits and are adapted for short seasons. Olga’s Yellow Chicken from High Altitude Gardens (which they no longer carry so I’d better save seed this year.) This is a nice yellow tomato that I grow as much for the name as for anything else. Galina Siberian from High Altitude Gardens A fabulous yellow cherry tomato. Huge indeterminate vines that will grow up and over anything (they’d be terrific in an arbor) and delicious fruit. Black Cherry from John Scheepers Kitchen Garden SeedsThis was a nicely-flavored black cherry tomato that I grew for the first time last year. I wish it had come in a little earlier than it did, but once it started producing it was prolific. Marglobe from Seeds of Italy Another Italian heirloom — great flavor in a compact round fruit. Principe Borghese from Seeds of Italy The perfect canning or drying tomato. Ripens in clusters like grapes. Jaune Flamee from Shepherd’s Garden Seeds (originally, this year I started seeds I saved myself, which is good because they don’t seem to be carrying them anymore.) This is a delicious orange tomato that also grows in clusters. I had great luck with this one last year and I’m so glad I saved seed! Perestroika Siberian from High Altitude Gardens My goal this year is to take better notes on the Siberian tomatoes — I can never remember which ones were better than the others. Prairie Fire from High Altitude Gardens This was my earliest tomato last year — produced a good three weeks before any of the other non-cherry varieties. A Montana native with compact and delicious fruits. Oh me too! Tomatoes, aubergines, bell peppers and a great many different types of chillis, I have the dormant makings of a ratatouille on my sunny windowsill. PS Spare bonck! These coded messages are rude at times!